The Trimble Configuration Toolbox software provides the tools to configure Trimble 5700 and R7 GPS receivers. The configuration settings are stored in an application file (*.cfg). UNAVCO configuration file (settings: elevation mask, 5 degrees; logging interval, 15 seconds; create a new file daily; minimum SVs, 1; automatically start logging data upon power-up). You can store application files on both your receiver and computer. The receiver also stores two special application files: Default and Current. These files represent the Trimble default (factory) configuration and the current receiver configuration, which, if a configuration file has been applied, is essentially a copy of that pre-specified configuration file. Multiple applications files can be managed to represent multiple users sharing a device and/or multiple modes of operation. They may also be saved to audit the operating settings of a receiver. The number of the total files a receiver can store depends on the receiver type. For more information about the limitations on application file storage, refer to your receiver manual. 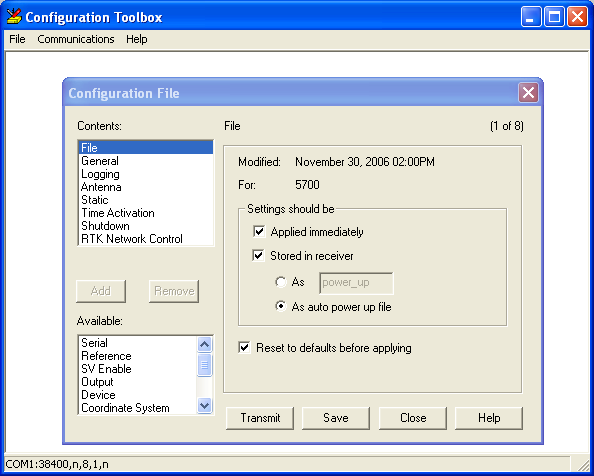 The Trimble Configuration Toolbox software is freely available and runs on Windows machines. Check the Trimble Support page for the most recent version. See also Trimble 5700/R7 - How to configure the receiver using Trimble Configuration Toolbox software. Posted by: Beth Bartel - Fri, Sep 24, 2010 at 1:46 PM. This article has been viewed 60619 times.